This is a solid stainless steel magnetic anklet. 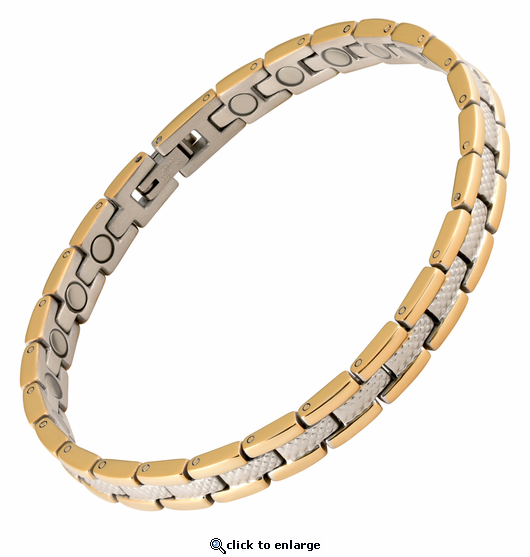 This nickel free anklet has a powerful & permanent 3300 gauss neodymium rare earth north facing magnet in each link. It has shiny 18k gold edges with a textured silver center. This anklet is about 1/4" wide and 1/7" thick. This anklet closes securely with a snap shut clasp. The Magnetic Therapy Anklet has most definitely improved the tendinitis in my ankle. Not only is it very comfortable but very attractive as well and was sized perfectly! The Customer Service was outstanding!!! My questions were answered promptly and courteously. I highly recommend purchasing from the Magnet Jewelry Store. It is much prettier than I expected. It fits well. Overall, I love wearing it but I'm not sure it's actually helping with pain. It's only been a few days so time will tell. So far has been good seems to help foot pain. Also on wrist that may or may not be helping broken wrist from years past. Looks good and wears well! too early to say if it is helping the joint pain! This ankle bracelet is very attractive. It has the look of fashion jewelry. The clasp is strong and secure. It arrived as advertised and on time. Deserves 5 star rating. I give a 5 rating to the ankle bracelets I received and am wearing. This is a five star. Sizing was perfect and price was very competitive. It makes a huge difference in my bursitis in hip. I have no pain!! I love this magnet anklet. I have arthritis in both large toe joints and my pain some days would be an 8 on a scale from one to ten. Now, many days there is little pain; maybe a 2-3 at the most. So glad I found you on the Internet. Sincerely. I don't wear an ankle bracelet often but I wanted a magnetic one for when I do. The links are beautiful and I should have gotten one for my wrist. I wear my anklet all the time and love it. It's too soon to know if it's alleviating my achiness, but I'll wear it because I like it. I really love this anklet. It is not only pretty, but seems to help the circulation in my legs. I have less swelling since wearing the anklet, not sure it's the reason, but seems as though it is. I also have the bracelet and wear both all the time, day and night. I owned the bracelet length of this anklet. My grand niece loved my bracelet and asked me if she could have an anklet to match my bracelet. I order it for her and she loves it! I will only ware only magnetic jewelry , I have at least 6 of magnetic jewelry on at a time, the only time they are off in when I am in shower or the hot tub ! They have stopped my pain all over my body, love them! I have both and I love them. They look great and I really think they help my pain. I've told many friends to purchase them. I really like the bracelet.I started waring it since 1 week for pain in my heel. No change in the pain yet.But I really like the bracelet. The service that I receive from Magnetjewelrystore.com was super. This is a very unique quality anklet. The fit is perfect and it is a good weight and quite a substantial look. The value for the price is very good. I had no surprises and I am very happy with this purchase. Thank you for the prompt delivery as well. I have had many magnetic ankle bracelets and always wear them. By far this is the best one I have every purchased. The price is very close to what I have paid for others in the past but the quality and quantity of the magnets far exceed. Highly recommend! My new ankle bracelet is beautiful. I haven't had the opportunity to wear it yet, but I still want to rave about the service that Magnet Jewelry Store provided me. When I first received my ankle bracelet it was too small because I had not measured correctly. But I returned it and asked to have two additional links added. I received it back yesterday and now it fits perfect. And there was obsolutely no additional charges even though it was my mistake. Now that is great service!!! Perfect size...looks great and seems to provide the relief I was seeking from an old knee injury from playing football 45 years ago! I purchased this for my husband.It is very attractive and the size was perfect. They called and e-mailed me, so I knew what to expect. I also bought the matching braclet. He seems to think it is helping him move better. Service was great and very refreshing to be able to talk to someone and have questions answered. It was here within a week-great service. These kind people at Magnet Jewelry Store. Did every thing to help me get what I needed & when I called them I got the question answered on the phone. Love the service I received. The magnets worked for me & were top quality the price was in line . So If you are In the market for a magnet. Go to Magnet Jewelry Store Or call Bob at 877-924-2767. I do feel a slight difference in my legs, although I have only been wearing this lovely anklet for a short time. It matches my bracelet, looks as good as my gold and silver jewelry, and the price is right. I am very satisfied with this product. I am very pleased with the quality and fit! Service was excellent. Will recommend to others. I am very pleased with my Ankle Bracelet. The quality is very good and the service was exceptional. Since my ankle is smaller than the average, I asked for a smaller size than was listed in the ordering information and they graciously complied. I have a perfect fit and am very happy with my purchase. Since my ankle measured a loose 8, I requested no additonal length be added to my order. The customized 8 you sent is a perfect fit and anything larger would have been too large. The anklet is wonderful. I love the look of it and it has really helped control my knee pain. Most of all I am very pleased that you make them to custom sizing. The service was exellent and I have already told my friends about your company. Thanks for a great product and even better service!